Are you an art, education, or museum studies student or recent graduate looking for an exciting and rewarding internship opportunity? Look no further than the Art Studio at The Eric Carle Museum of Picture Book Art. 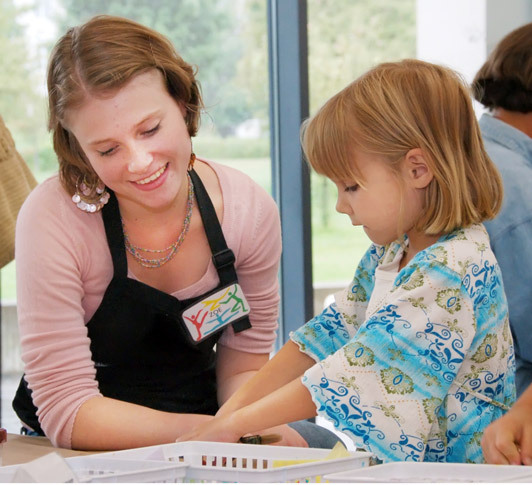 Interns in the Art Studio interact with families and professionals daily, participate in museum-wide events, expand their knowledge about museum and art education, design special projects for museum guests, and contribute ideas to our daily programming. We've had many amazing and creative interns in the past, and wanted to share a few of their stories with anyone interested in applying to our program. Besides sharing their most memorable experiences during their time at The Carle, our former interns also have words of encouragement for any prospective interns. The opportunity to design your own Special Sunday project for Museum guests is one of the highlights of an internship here in The Art Studio. Interns have found that it is a rewarding experience to go through the process of designing and developing a project from beginning to end and to see the unexpected ways guests approach and interact with the project. The chance to develop an independent project in the Studio allows for the opportunity to build confidence and discover new experiences in artistic practice. "I will be conducting research on the effects of the Israeli-Palestinian conflict on the work of contemporary visual artists in the region and their ability to offer insight on the social value of art. Through ethnographic work with artists and museum professionals, I will examine how contemporary Israeli art is influenced by the sociopolitical issues that pervade the Middle East as well as whether the arts can be used as a tool to mobilize individuals and how they might promote mutual understanding among people." The Special Sunday project is not the only project interns work on. They also contribute visuals and tutorials for our resource center, design window displays, contribute blog posts about their projects and experiences, and create activities for the light table and special activities for toddlers. The Studio is a supportive and challenging environment to both guests and staff. Former interns are active participants in their arts communities in a variety of ways. All are either working on or have completed their undergraduate degrees in a variety of majors. Some have worked towards higher degrees and certifications in fine arts, art therapy, and education. Others work for community arts organizations, professional photographers, and teaching roles with preschool and elementary-aged children. If you feel like this opportunity is perfect for your interests and career path, visit the Internship Program page for descriptions, application requirements and deadlines. For more examples of projects by Art Studio interns, click the “Art Studio Internship” category on the right. Thank you to all of the Art Studio intern alumni who shared their thoughts and stories! Making Art Together is generously sponsored by the Massachusetts Educational Financing Authority. This entry was posted on Wednesday, February 25th, 2015 at 12:53 pm and is filed under By Meghan Burch, Internship Program. You can follow any responses to this entry through the RSS 2.0 feed. You can leave a response, or trackback from your own site.